Quite funnily, I still have a child-like enthusiasm around the fact that a tap on your smartphone can line up a taxi ‘as and when you want it’! As a result, I have been following the traction within the cab hailing/ride-sharing app segment for a while now. The latest to catch my eye is Lyft -a ride hailing app that has attracted massive patronage amongst users due to its ‘fun’ vibe and the ‘not-to-miss’ pink glowstache! The brand has an amazing way of marketing themselves, and one of the few tactics that shine through the process is the use of referral marketing via In-app referrals and referral marketing driven by word-of-mouth. 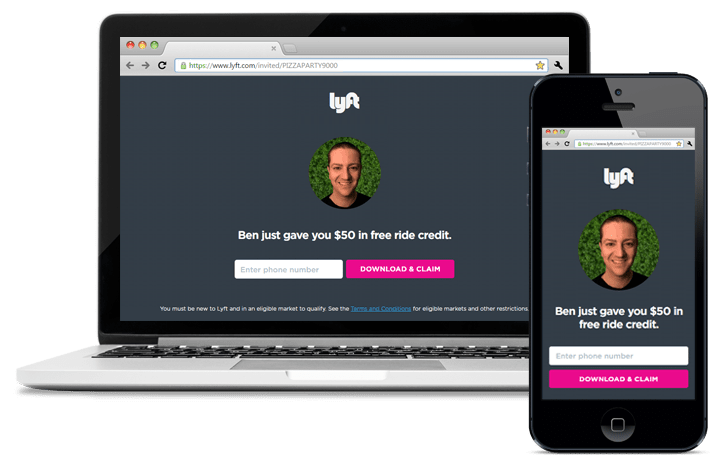 In a market overpowered by UBER and other such contemporaries, it is valuable to understand how to make the elements of referral marketing stand out, and Lyft’s marketing is full of insights on it. 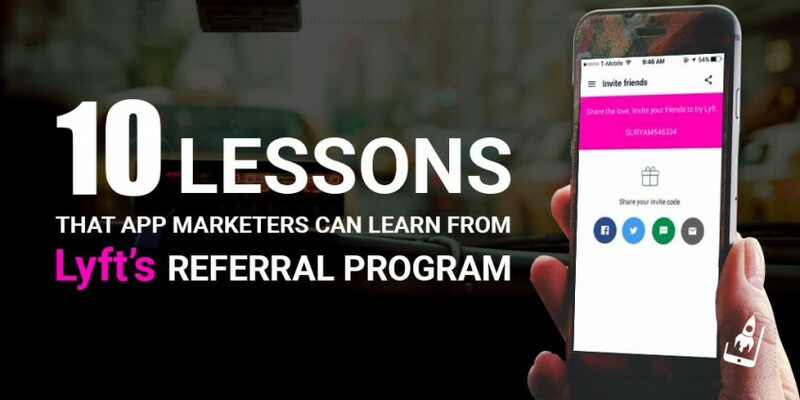 Lyft’s referral marketing strategy not only covers the numerous ways to use this tactic but also the ways in which it can help app marketers to overpower competition. Lyft has a referral program meant for both its passengers and its drivers. We analysed both of them closely and had numerous takeaways, which we’ve listed below for you all. If you are running an app referral program, chances are that either it is built in-house, or it is supported by a platform like AppVirality. Either way, it will have a lot of common elements which impact the final look and feel of your referral campaign. In a market which is swarmed with In-app referrals, this may get confusing for an end user. It is necessary, therefore, that app marketers also focus on the visual aspect or the presentation before a campaign goes live. This will help a brand to create a unique talking point and at the same time maintain a sense of uniqueness. A lacklustre approach or treating an app referral program as an external part of your app will do more damage than good. Lyft’s In-app referrals are an extension of its brand’s identity and work very well with creating a strong recall value in the mind of its users, especially for those who have downloaded the app for the first time. When it comes to referral marketing, most app marketers stop at just that. In other words, it becomes a ‘refer and earn’ program for app users with just an incentive bait. Obviously, the users don’t feel valued after a while and stop referring. Most app marketers tend to put a lot of weight on their app referral campaigns in terms of achieving fastidious growth. Yes, In-app referrals have the ability to bring in a stream of users to your app; however its is a futile exercise if the growth plan lacks any focus on improvising the core features of their app. A great take away from Lyft is to work on both these aspects side by side. Any improvement, update or added features have the ability to re-ignite the interest and spread a word-of-mouth around your app. An app referral campaign at this stage is bound to do well considering that your users are already satisfied by your app’s features. 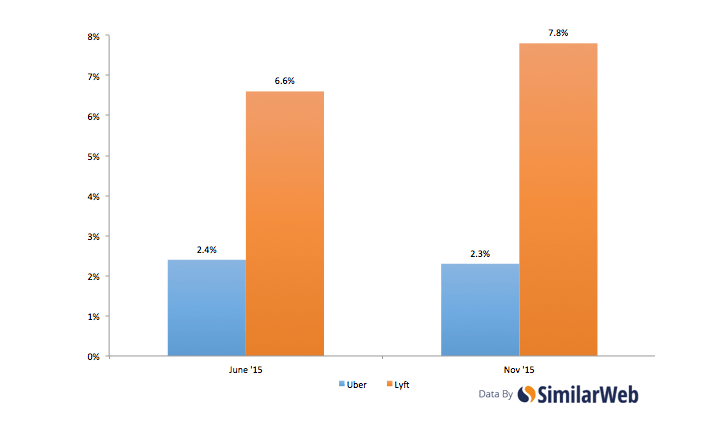 A recent report published in Forbes states that users are more likely to open Lyft app than UBER. Even though UBER has more app installs, Lyft’s has owned the competition by offering fierce engagement avenue to its user. This is significant since a lot of users are leaving UBER and moving towards Lyft. 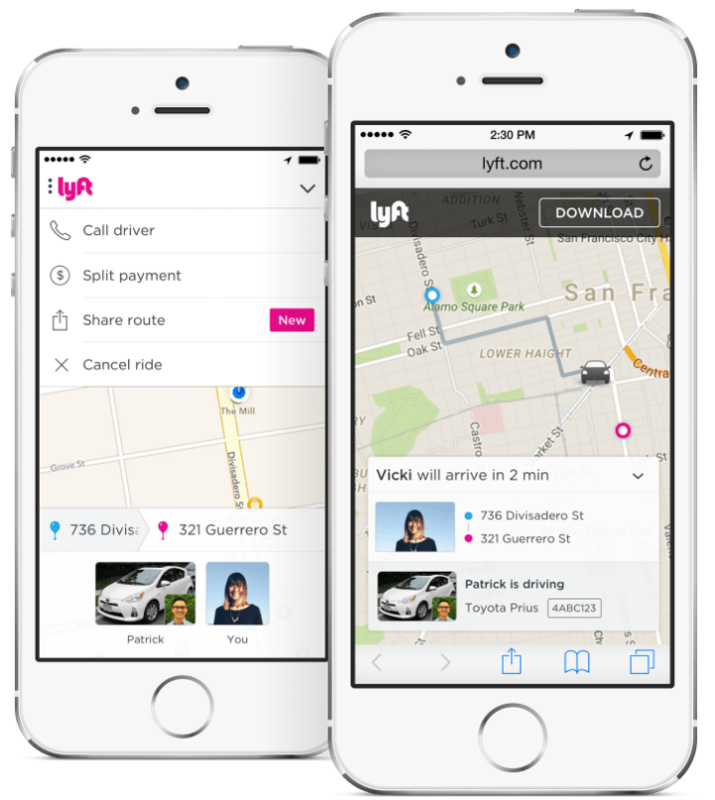 Lyft’s driver referral campaigns offer a scrumptious referral value. At the same time, it offers a much higher sign-up bonus as well. This spikes up the engagement many folds. Lyft does not have any cap on its referral incentives as compared to its competitors. This provides a great talking point amongst its users, which in turn attracts heightened engagement. It’s true that app marketers spend a lot of marketing dollars on promoting their referral campaigns on online platforms. They make every attempt to ease the process for the user by building a seamless and easy to share program that enables social sharing, sharing via emails and other such platforms. Ina Herlihy, a growth marketer, has mentioned the agony of sharing these codes with fellow users in an interesting article that talks about her experience with referral codes. Remembering the code : Many of the referral codes are random combinations of letters and numbers, so I’d have to look up the code in the app on my phone. Writing the code down : I mostly take rides if I am leaving Tradecraft particularly late. Since it’s dark, it was challenging to write my code(s) in the driver’s notebook or on the back of a random receipt because I had difficulty seeing what I was writing, or writing while the car was moving. The lesson of the story is that sometimes your users may be keen to refer a friend/acquaintance to your referral program but may not be able to pursue it due to unique challenges like the ones mentioned above. Lyft has a way around this unique situation and have an official tie-up with Vistaprint that facilitate sharing of referral links and codes! Sleek, isn’t it? Sharing and talking about referral schemes on social accounts is a given and most app marketers do that. However, they often miss on opportunities due to lack of reiteration amongst their user community. A seamless web to mobile experience is a must. Even then, it is very common to witness a broken link or an irrelevant landing page when a users checks an app referral link via a website and not on his mobile device. 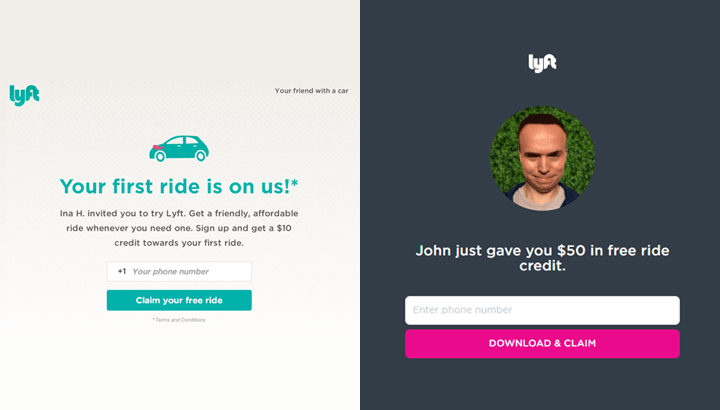 Lyft has mastered the art of landing page for its users. A quick glimpse at this links shows the convenience it may offer to first time users. Personalization is the key to success for any referral campaign. A friendly face or a name can increase the chance of a new user installing an app due to a sense of familiarity. A Nielsen report also asserts that 83% user’s trust recommendations from friends and family. Lyft’s In-app referral program showcases personalization as it ought to be! An overview of Lyft’s driver referral program brings us closer to the need of experimentation with the incentive value. An incentive has a financial implication and therefore one needs to understand and evaluate it thoroughly. While it is quite understandable that taking on a big competitor isn’t easy, there are always means and ways to execute it. In Lyft’s case, it is by providing an incentive value which is appealing and better than the competitor. 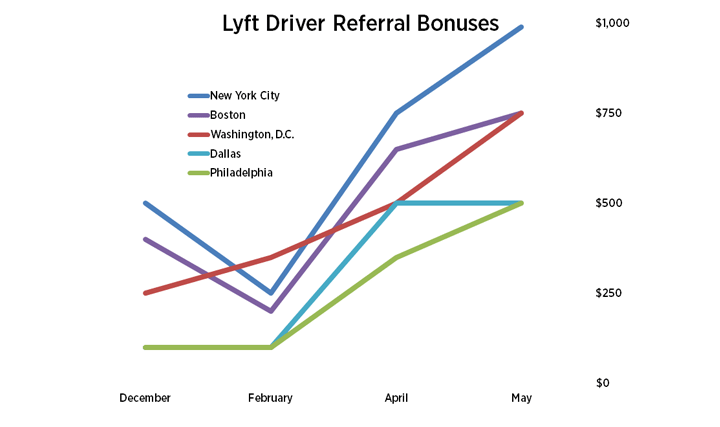 Here’s a quick glimpse at Lyft’s referral bonus in various cities in the US. While this strategy has garnered a lot of flak from industry experts at the moment, it seems to be working for Lyft’s growth. 10.Give More Mouths To Word Of Mouth! Most high voltage startups have leveraged the power of an active community. This is also a way to build a consistent word of mouth, offline, which ultimately translates in more and more people wanting to test the app. This in simple words mean, more app installs! Lyft is one of the newest examples of extended word of mouth via a community! Referral marketing isn’t easy and may not help your app grow if it lacks a strategic approach. While we are crusaders of in-app referrals, we also realise that attracting users to your app may also mean leveraging offline word-of-mouth and referral marketing. Why Things Catch On And What Makes Airbnb’s App Referral Program A Hit With Users? Is Your In-App Referral Program Safe or Exposed to Fraud?